Stopping safely is one of the most important functions a motor vehicle can perform. Failure of the brake system will almost invariably result in property damage, personal injury, or even death. Consequently, a great deal of consideration has been given to improving the brake system in trucks and passenger cars over the last nine decades. One of the latest improvements is an antilock brake system which, as the name suggests, prevents a vehicle's brakes from locking up and skidding during hard stops on wet or icy roads. The problem of skidding reveals the one overwhelming weakness of all motor vehicle braking systems: they depend strongly on the coefficient of static friction between the tire and the road. If for any reason the tire momentarily loses its adhesion to the road while the brakes are applied, the friction of the brakes against the drums or rotors locks the wheel solidly and the tire begins skidding across the road. In this condition, the braking force of that wheel is dependent on the sliding friction between the tire and the road, which is much less than the static friction. Under wet or icy conditions, the sliding friction is reduced even further, resulting in significantly longer stopping distances. In addition, when the front wheels are in this condition, they cannot be used to steer the vehicle; regardless of the angle of the front wheels, the vehicle continues to skid in whatever direction its momentum sends it until either the driver releases the brakes or the vehicle collides with something solid enough to bring it to a halt. Generations of drivers were taught to handle this condition by quickly applying and releasing, or pumping, the brakes during a skid. However, this training was often lost during panic situations. Additionally, even the calmest and best-trained driver could not pump the brakes faster than two or three times per second, which limited the effectiveness of the technique. A better way to handle skids while braking had been used on aircraft for decades before it was introduced in ground vehicles. Aircraft were subject to the same low-traction conditions as were cars and trucks, and a skidding aircraft—already only marginally steerable—was truly a danger to its occupants and those around it. To combat this problem, many aircraft were equipped with antilock brake systems, known as ABS, which prevented the braking wheels from locking up and skidding on slippery runways. At first, this was accomplished through elaborate and expensive hydraulic controls which cycled the brakes on and off rapidly, permitting the airplane to be steered under slippery conditions while still allowing a large measure of stopping ability. Later, electronic controls permitted anti-lock action that was more responsive to actual ground conditions. As the electronic and hydraulic portions of aircraft ABS became smaller and less expensive, truck and automobile manufacturers began to take interest. At first, antilock brake systems were developed only for heavy-duty trucks. Large semi trucks—truck tractor-trailer combinations weighing up to 80,000 pounds (36,364 kg)—were especially hazardous to traffic around them when they skidded since they not only moved out of the driver's control, but also articulated, or jack-knifed, and frequently rolled over. Today, antilock brake systems are standard on many cars and trucks. Regardless of manufacturer or the type of vehicle, all antilock brake systems operate in a similar manner. Wheel speed sensors are placed on each wheel that is to be controlled. Each speed sensor usually has a toothed wheel, like a gear, that rotates at the same speed as the vehicle wheel or axle. Mounted close to, but not touching this toothed wheel, is a permanent magnet wrapped with a coil of wire, called the pick-up coil (see illustration). As each tooth rotates past the permanent magnet, it causes the magnetic field to concentrate and increase slightly. This, in turn, induces a small pulse of current in the coil of wire. The number of pulses per second are directly proportional to the speed of the wheel. The faster the wheel turns, the faster the teeth pass the magnet and the higher the pulse rate. The pulsed output from the wheel speed sensors goes to an electronic controller, which monitors each wheel's speed relative to the speed of the other wheels. As long as the brakes are not being applied and all of the monitored wheels are rotating at roughly the same speed, the system takes no action. If, however, the brakes are being applied and one or more of the monitored wheels suddenly begins to reduce speed at a higher rate than the others—indicating a loss of traction with the road and an imminent wheel lockup and skid—the controller then activates the antilock system. The antilock brake system on any vehicle is simply an additional monitoring and controlling function superimposed on the existing vehicle brake system. ABS is not a second brake system, nor does it replace the vehicle brake system. When all four wheels on an automobile are monitored and controlled, the system is called a four-channel ABS. If the front two wheels plus the rear axle (but not each rear wheel individually) are to be controlled, the system is called a three-channel ABS. On heavy trucks with two rear drive axles, the ABS is commonly a four-channel system which controls the front wheels and two of the four rear wheels. Trailers pulled by heavy truck tractors may also have their own separate ABS which must interconnect with the ABS on the tractor. In an automobile, the brakes are actuated by hydraulic pressure. The ABS controller operates solenoid valves built into the high pressure side of the master brake cylinder. These valves are normally open and do not interfere with braking. When the controller senses that a wheel is locking up while braking, it first activates a solenoid to close a valve in the affected wheel's brake line which prevents the pressure from increasing any further. If the locked wheel continues to lose speed, the controller activates a second solenoid which bleeds pressure off the affected brake line, in effect releasing the brake for that wheel regardless of whether the driver is still pushing on the brake pedal. As soon as the wheel regains traction and its speed increases, the solenoids are de-activated, and normal braking resumes. Of course, if the conditions are such that the wheel starts to skid again, the brake will promptly begin to lock up and the ABS will take over. This cycle is repeated 12 to 15 times per second until either the road condition changes or the driver releases the brakes. The driver will be able to detect this rapid cycling as a vibration felt through the brake pedal, but will not have to take any action. The ABS will minimize the skid and will allow the driver to maintain directional control of the vehicle. The brakes on a heavy truck are actuated by air pressure, rather than hydraulic pressure. The antilock brake system on a truck works in a manner similar to the ABS on an automobile, except the antilock air pressure control valves are located on the vehicle frame rail, near each wheel. An antilock brake system is designed for a specific vehicle application. A truck which does not pull a trailer, like a cement mixer, would have a slightly different ABS than a truck tractor which pulls one or more trailers. Likewise, an antilock brake system for a trailer would have a different design. Regardless of manufacturer or the type of vehicle, all antilock brake systems operate in a similar manner. Wheel speed sensors are placed on each wheel that is to be controlled. Each speed sensor usually has a toothed wheel that rotates at the same speed as the vehicle wheel or axle. If the brakes are applied and one or more of the monitored wheels suddenly begins to reduce speed at a higher rate than the others, the controller activates the antilock system. brand name and model of car. Since ABS components must fit and function along with existing vehicle components on each model, the design and manufacturing process of a new antilock brake system is carried out in partnership between the automobile manufacturer and the ABS supplier. The toothed wheel or gear in the speed sensor is made of soft iron, usually cast. Iron is chosen because of its high magnetic permeability and low magnetic reluctance. Magnetic reluctance is roughly equivalent to electrical resistance, and sometimes the toothed wheel is called the reluctor. The function of the toothed wheel is to allow the permanent magnet's field to easily pass through each tooth to cause a momentary concentration of field strength which induces a current in the pick-up coil. The pick-up coil has a permanent magnet in the core, wrapped with a coil of copper wire. The controller usually employs transistors known as hot-side drivers which control the power side of the circuit rather than the ground side. These transistors produce more heat than is usual in an electronic circuit. Rather than being placed in a plastic or stamped steel housing, they are attached to a cast aluminum housing with a finned heat sink to dissipate the heat. The hydraulic brake pressure solenoids used in automobiles have a standard construction of copper coil elements with steel valves and bodies. They are housed in the same casing as the brake system master cylinder which is usually cast from aluminum. The electrical wiring is copper, often with cross-linked polyethylene insulation. To prevent radio frequency interference (RFI), in which high-power radio signals might be received through the wiring and cause the system to activate, all wiring is either shielded or the wires are run as twisted pairs to cancel out the effects of radio waves. Connectors are plastic with internal copper contacts. The manufacturing process for antilock brake systems consists of manufacturing the component parts and then installing those parts on the vehicle. The parts are built in one plant, then packaged and shipped to a vehicle assembly plant for installation. 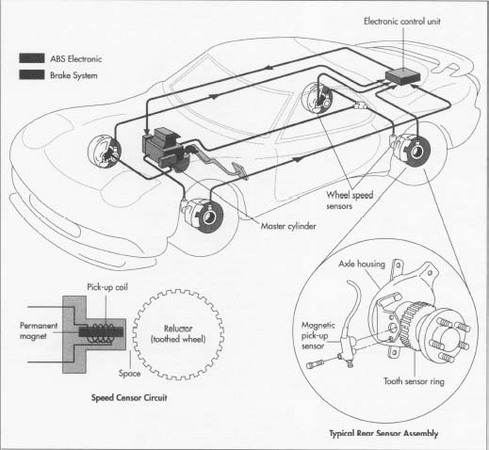 This is a typical process for an automobile antilock brake system. 1 The master cylinder, including the base for the solenoid body, is cast as a single unit. The seating and sealing surfaces are machined smooth and the connection ports are threaded. 2 The individual primary and secondary pistons, solenoid coils, reservoir caps and seals, pressure accumulator, and any metering and proportioning valves are installed. The solenoid body has a cover which attaches to the master cylinder with four or more screws and is sealed with a gasket. 3 The toothed wheel is cast from iron. Minor machining may be required at the mounting points. 4 The pick-up coils are wound around the permanent magnet core in a machine called a coil winder. The entire assembly is encased, or potted, in plastic resin with an electrical connector attached. 5 The electronic controller components are soldered to a printed circuit board. 6 The board is connected inside a protective housing and mounted to the cast aluminum heat sink base. Extemal electrical connections are provided for the input wiring from each speed sensor and the out-put wiring to the solenoids in the master brake cylinder. 7 In the automobile assembly plant, the steel tubing brake lines are installed in the framework of the body. They run from the partition between the engine compartment and the occupant compartment, called the firewall, to the vicinity of each wheel. The electrical wires for the ABS are also run from the vicinity of each wheel to the controller location and from the controller to the firewall. 8 The brake master cylinder is bolted to the firewall in the engine compartment near the brake pedal. The brake lines are attached to the appropriate ports on the solenoid body, and the electrical wires are connected. 9 The toothed sensor wheels are pressed onto the outer constant velocity joints or the ends of the axle spindles so that they ride just inside the wheels. Once the axles are attached to the frame, the brake lines are attached and the pick-up coils are installed so that the end of the coils are close to the toothed wheels. The pick-up coils are then electrically connected to the wires to the controller. 10 The controller is installed either under the instrument panel or in the vehicle's trunk. The electrical connections are made, including the power connection from the vehicle battery through the fuse-box. The idea of an electronic system being able to take over the operation of a vehicle's brakes is disturbing to some people. For this reason, the operation of the system is thoroughly tested beforehand, and the quality of the installation is constantly reviewed. In addition, all antilock brake systems are designed to be fail-safe—that is, any failure of any component will cause the system to fail in such a manner as to still allow the overall safe operation of the brakes. There is a strong possibility that the federal government will mandate the use of antilock brakes on certain vehicles in the near future. ABS has been in use for several years, and evidence mounts regarding its benefits—specifically its ability to improve vehicle stopping distances and to maintain vehicle directional control under extremely slick road conditions. These findings are not without controversy, however. Initial claims of the benefits of ABS were significantly overstated, and many drivers have found that ABS offers them little or no advantage in their particular situation. In this respect, the controversy is a little like the one that surrounded seat belts. Additional systems have been developed that enhance the benefits of the basic ABS. One of these systems is automatic traction control, called ATC. ATC uses the same components as ABS, but works at the other end of the speed spectrum—getting a vehicle started under slippery conditions. In operation, it senses each wheel's speed to detect when one or more wheels "break loose" and start to spin. When that happens, it applies the brake on that wheel 12 to 15 times per second to let it slow down and regain traction. In demonstrations, vehicles have been held by blocks on an ice-covered grade. When the vehicles start and the blocks are pulled away, the vehicle without ATC spins its wheels and slowly slides backwards down the grade, while the ATC-equipped vehicle pulls its way up the ice. It is expected that ABS, along with other new vehicle products, will continue to increase in popularity as the price goes down and the benefits become more apparent. Chaikin, Don. "How It Works: Antilock Brakes." Popular Mechanics, July 1993, p. 88. Kirk, John. "Antilock Brake Systems." Home Mechanix, March 1993, pp. 16-18. Kott, D. "Anti-Lock Braking Systems." Road and Track, February 1994, p. 110. Murray, C. "Making a Comeback in the Big Rigs (ABS)." Popular Science, July 1993, p. 38. Sherman, Don. "Controlling Traction." Popular Science, April 1994, pp. 87-90, 96-97.